MOVEit Transfer works with any FTP client, but we offer a range of more specialized clients. 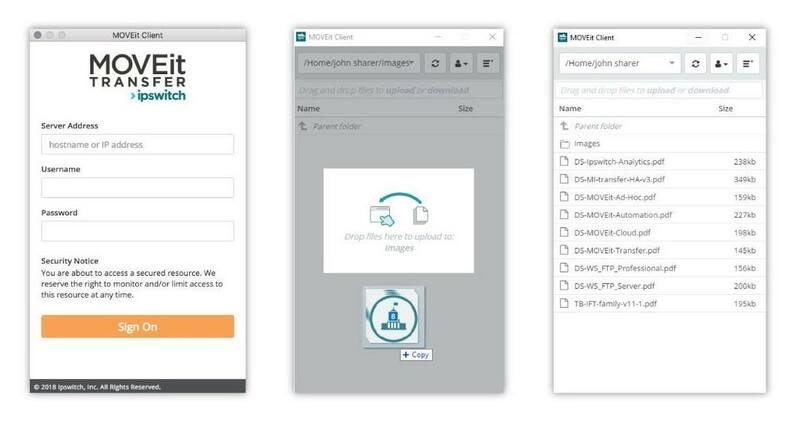 This easy-to-use, drag and drop tool makes it easy for end-users to share files, internally or externally, with the full security, tracking and logging of a MOVEit file transfer. Supported on both Windows and MacOS platforms and built using the MOVEit REST API, this new client can broaden adoption of MOVEit across your end-user based without any training required. MOVEit EZ is a unique secure transfer client that moves files on a scheduled, automated, firewall-friendly basis between Microsoft Windows 7, 8.1 and 10 desktops and a MOVEit Transfer server, with minimal user involvement. MOVEit Freely is a free command line FTP/secure FTP SSL (FTPS) client for Windows 7, 8, and 10 systems. MOVEit Freely can safely exchange files with secure FTP servers that support 128-bit key SSL (Secure Socket Layer) encrypted transfers, the highest level of protection currently available for Internet communications. MOVEit Freely was one of the first clients to support all three FTP over SSL modes (TLS-P, TLS-C, and IMPLICIT).